The Jesse’s Journey Board of Directors is pleased to announce the appointment of Jeff Preston, Ph.D. as Chair of the Board, effective September 17, 2018. Jeff has been a long-time supporter of Jesse’s Journey, having sat as a board member for the past two years. He is also active in fundraising as the inspiration behind the Jeff Preston Celebrity Golf Tournament, held each year in Port Elgin, Ontario. 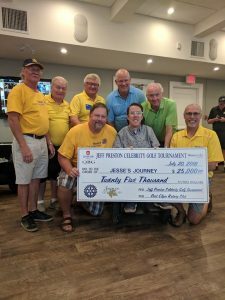 This event, supported by the Rotary Club of Port Elgin, has raised significant funds for Duchenne research through Jesse’s Journey and continues to be a highly anticipated event in the Saugeen Shores region. 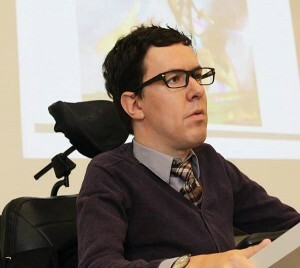 Jeff is an assistant professor of Disability Studies at King’s University College at Western University where he teaches classes on disability, popular culture and policy. A long-time advocate and motivational speaker, in 2008 Jeff drove his electric wheelchair 650km, from London to Ottawa, to raise awareness about the lack of accessible transit in the province. Jeff is currently vice chair of the Committee of Adjustment at City Hall and vice chair of the leadership table for London 4 All, a working group organized by the United Way of Elgin & Middlesex to complete recommendations generated by City Hall’s poverty panel. Jeff brings his academic interest and personal passion to his new role as Chair of the Board of Directors. As Chair, he will lead a dedicated and skilled group of volunteers to provide governance and strategic direction to the organization. We are pleased to welcome Jeff as our new board chair and we are grateful for his continued support of Jesse’s Journey.